URIAH HEEP - DEMONS AND WIZARDS VINYL (LP) | Online Shop | Wizard LTD. 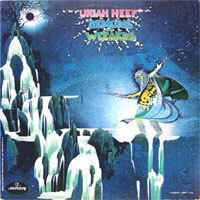 Album: "DEMONS AND WIZARDS VINYL (LP)"
Demons and Wizards is the fourth album released by British rock band Uriah Heep. The original vinyl release was a gatefold sleeve, the front of which was designed by Roger Dean. The songs "The Wizard" and "Easy Livin&apos;" were released as singles in the United Kingdom and North America, as well as many other markets. "Easy Livin&apos;" entered the US Top 40 at #39, making it Heep&apos;s first American hit. "Easy Livin&apos;" was also a mega hit in New Zealand and Germany, countries which were becoming a strong market for the band. It reached a disappointing #75 in Australia.